Don’t let the holes fool you. 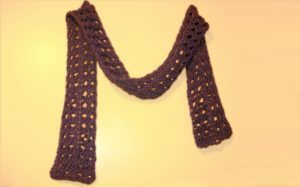 You can be warm and snug with a thick, lacy scarf. The combination of bulky yarn, a thick afghan hook, and Tunisian crochet makes for a scarf that is super squishy. You’ll be ready for winter in no time. This pattern requires familiarity with Tunisian crochet. Click the link for a great list of resources if you’re just learning or even if you just want to learn more. Work rows 1 – 9 in pattern. Need help understanding the abbreviations and symbols? Check out the crochet abbreviation chart and the Tunisian crochet abbreviation chart. This entry was posted on Tuesday, August 23rd, 2016 at 12:00 AM by Candace	and is filed under Free Crochet Patterns. You can follow any responses to this entry through the RSS 2.0 feed. You can skip to the end and leave a response. Pinging is currently not allowed.